What do long noncoding RNAs and Pseudogenes do? – Bio-Synthesis, Inc.
Home › BNA RNA › What do long noncoding RNAs and Pseudogenes do? Pseudogene long noncoding RNA networks appear to regulate transcription and translation in human cells. Pseudogenes are now thought to be nonfunctional relatives of genes and can be defined as fragments of nucleotide sequences that resemble a domain of a known protein but have stop codons or frameshifts in mid-domain. These genes appear to have lost their protein-coding ability or are no longer expressed in the cell. Where do Pseudogens come from? Presently scientists think that pseudogenes can result from the accumulation of multiple mutations within a gene or arise from either retrotransposition or genomic duplication of functional genes. They are considered to be “genomic fossils” and are valuable for exploring the dynamics and evolution of genes and genomes. Pseudogene identification is an important problem in computational genomics but no consensus computational scheme for defining and detecting pseudogenes has been developed thus far. In the past pseudogenes were often labeled as “junk” DNA. New research indicates that they may have a function after all. What are long non coding RNAs (lncRNAs)? Long non-coding RNAs are non-protein coding sequence transcripts that contain more than 200 nucleotides. There size distinguishes lncRNAs from small regulatory RNAs such as microRNAs (miRNAs), short interfering RNAs (siRNAs), Piwi-interacting RNAs (piRNAs), small nucleolar RNAs (snoRNAs), short hairpin RNA (shRNA), and other short RNAs. Since the central dogma of gene expression is that DNA is transcribed into messenger RNAs that serve as the templates for protein synthesis lncRNAs where considered in the past as “junk” DNA or the “dark matter” of DNA. The discovery of extensive transcription of large RNA molecules that do not code for proteins provided a new perspective on the roles of RNA in gene regulation. New findings from the study of multiple model systems suggest that lncRNAs form extensive networks of ribonucleoprotein (RNP) complexes with numerous chromatin regulators to target these enzymatic activities to the appropriate locations in the genome. Apparently lncRNAs can function as modular scaffolds to specify higher-order organization in RNP complexes and in chromatin states. Recent research in human transcriptome analysis showed that protein-coding sequences only account for a small portion of the genome transcripts. The majority of the human genome transcripts are non-coding RNAs now called long-non-coding RNAs (lncRNAs). Chen et al. in 2013 describe a long-non-coding RNA (lncRNA) and disease association database (LncRNADisease). This database is publicly accessible at http://cmbi.bjmu.edu.cn/lncrnadisease. A large number of lncRNAs have now been identified and there is increasing evidence that shows that lncRNAs play critical roles in various biological processes. This has led to associate the dysfunctions of lncRNAs with a wide range of diseases. This has also become apparent during the recent AACR 2013 meeting which suggested that LncRNAs are potential novel molecules as target for disease diagnosis, treatment and prognosis. The LncRNADisease database integrated several types of data, such as experimentally supported lncRNA-disease association data, experimentally supported lncRNA interaction data and predicted lncRNA–disease association data. Thousands of lncRNA have now been identified but only a limited number of lncRNAs have been reported to be associated with diseases so far. Recently Johnsson et al. report that a pseudogene long noncoding-RNA network regulates PTEN transcription and translation in human cells. The tumor-suppressor gene phosphatase and tensin homolog (PTEN) is a negative regulator of the PI3K-Akt pathway and it has been found that is epigeneti­cally silenced in several cancers. Furthermore, it has been found that the dosage of PTEN expression correlates with the severity of epithelial cancers. More and more it becomes apparent that a fine-tuned regulation of the PTEN gene is criti­cal for maintaining cellular homeostasis which is important for good health in humans. The expression of PTEN is post-transcriptionally regulated by the action of a PTEN pseudogene (PTENpg1, also known as PTENp1, PTEN2 and PTENΨ1) which is a long noncoding RNA that sequesters numer­ous PTEN-targeting microRNAs (miRNAs) by acting as a miRNA sponge (read on below for more info on this). The observed miRNA-sponge effect from overexpressing the 3′ untranslated region (3′ UTR) of the PTENpg1 lncRNA resulted in increased PTEN mRNA stability and increased amounts of PTEN protein, presumably owing to miRNA sequestration away from the PTEN protein-coding transcripts. In contrast, suppression of the PTENpg1 lncRNA released miRNAs, which instead led to destabi­lization of PTEN. Johnsson et al. characterized a previously unidentified PTENpg1-encoded antisense RNA (asRNA) that regulates PTEN transcription and PTEN mRNA stability. The research group identified two PTENpg1 asRNA isoforms, α and β, and report that the α isoform functions in trans, localizes to the PTEN promoter and epigenetically modulates PTEN transcription by the recruitment of DNA methyltransferase 3a and Enhancer of Zeste. Furthermore they report that the β isoform interacts with PTENpg1 through an RNA-RNA pairing interaction affecting PTEN protein output through changes of PTENpg1 stability and microRNA sponge activity. The disruption of this asRNA-regulated network induces cell-cycle arrest and sensitizes cells to doxorubicin. This suggests a biological function for the respective PTENpg1 expressed asRNAs. In addition, the research group used single-stranded phosphothioate oligonucleotides (ODNs) to target the PTENpg1 asRNA α variant. Unlike siRNAs ODNs function via the RNase-H pathway. This pathway induces strand-specific targeting of RNA followed by the degradation of the RNA-ODN duplex. The researchers report that the suppression of the PTENpg1 asRNA α variant caused a substantial loss of DNMT3a at the PTEN promoter in two different cell lines. The scientists demonstrated that the PTENpg1 asRNA α binds and recruits the chromatin remodelers DNMT3a and EZH2 to the PTEN promoter and catalyzes the formation of H3K27me3. Next, they investigated whether the endogenous PTENpg1 asRNA α localizes to the PTEN promoter and more specifically to the H3K27me3 chromatin mark. The researchers carried out a modified ChIP protocol for H3K27me3 and analyzed whether the nuclear-localized PTENpg1 asRNA associated directly with this epigenetic mark and found that endogenous unspliced PTENpg1 asRNA localized to this histone mark. Model of PTENpg1 asRNA–based regulation of PTEN. The PTENpg1 locus is transcribed in both sense (red) and antisense orientation (blue). Three different isoforms of the PTENpg1 asRNA are transcribed: PTENpg1 asRNA α, β and the unspliced nuclear-localized PTENpg1 asRNA α. PTEN transcription is suppressed by the PTENpg1 asRNA α and unspliced isoforms, which act in trans by recruiting the chromatin-repressor proteins EZH2 and DNMT3A to the PTEN promoter. The PTENpg1 sense lacks a poly(A) tail, and the stability and export of PTENpg1 sense to the cytoplasm is facilitated by the interaction with the spliced PTENpg1 asRNA β transcripts. Such interactions lead to an increase of PTENpg1 sense sponge activity and thus increased PTEN mRNA stability and translation. This mechanism results in both transcriptional and post-transcriptional regulation of PTEN by its pseudogene (Adapted from Johansson et al 2013). The data presented in the paper argue for a more complex role for lncRNAs in human cellular gene regulation than what had previously been appreci­ated. The scientists find that lncRNAs can form higher-ordered biologi­cally relevant functional structures through RNA-protein as well as RNA-RNA interactions. Earlier studies have reported that PTENpg1 sense lncRNA functions as a miRNA sponge, an interaction that has typically been thought to occur in the cytoplasm. It was suggested that, mechanistically, PTENpg1 sense lncRNA binds the PTEN tar­geted miRNAs, whereby the miRNA targeting of PTEN is diminished, ultimately resulting in increased PTEN mRNA and protein expres­sion. Improved biochemical and molecular biological methods are now available to create tools for the study of this type of interactions in cellular networks. Small DNA and RNA oligonucelotides as well as very long DNA and RNA oligonucleotides can now be created using both chemical or enzymatic synthesis approaches. Furthermore, biomimetic oligonucleotides that can contain artificial nucleic acid monomers such as bridged nucleic acids (BNAs) or other modified nucleic acids to stabilize these molecular tool in vivo can now also be synthesized routinely and have become commercially available. Geng Chen, Ziyun Wang, Dongqing Wang, Chengxiang Qiu, Mingxi Liu, Xing Chen, Qipeng Zhang, Guiying Yan, and Qinghua Cui1; LncRNADisease: a database for long-non-coding RNA-associated diseases. Nucleic Acids Research, 2013, Vol. 41, Database issue D983–D986. doi:10.1093/nar/gks1099. Per Johnsson, Amanda Ackley, Linda Vidarsdottir, Weng-Onn Lui, Martin Corcoran, Dan Grandér & Kevin V Morris. 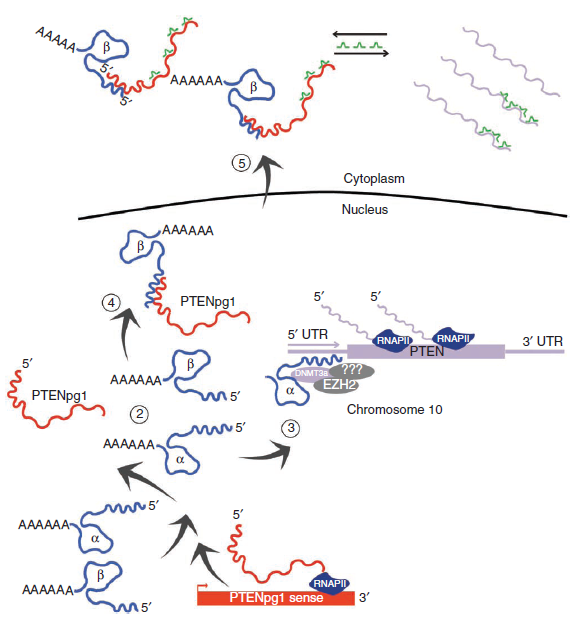 2013; A pseudogene long-noncoding-RNA network regulates PTEN transcription and translation in human cells. Nature Structural & Molecular Biology 20, 440–446 (2013) doi:10.1038/nsmb.2516. ‹ What is a Gapmer?